Thirsty Thursdays every Thursday at the Diva Den. Health and wellness is an important part of the cannabis community. 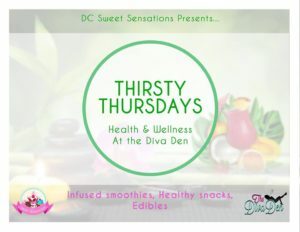 Join us at the DIVA DEN for an uplifting event with infused smoothies, healthly snacks and edibles. We will discuss CBD usage and other health topics impacting the cannabis community.